This fascinating design bears similarities to Frederick Rhead's most famous pattern, Yuan, and its lesser-known counterpart Orient. It depicts a detailed watery oriental landscape with small figures amongst trees, rocks, bridges, houses on stilts, temples, boats etc. Different parts of the pattern appear in different places on different items, and only on the larger items does one find the complete pattern. The border is also reminiscent of Khotan, with its interlocking fret patterns. 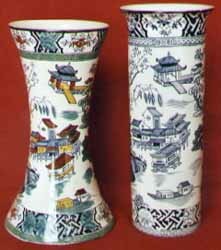 We presume the name of this pattern refers to the Kang-Hsi period of Chinese porcelain (1662-1722 ). 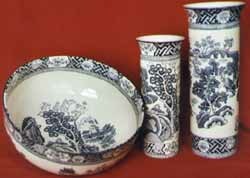 Kang-Hi is most commonly found as a blue & white pattern, but coloured examples can occasionally be found with green, red, yellow and brown hand-painting over the blue transfer (see photo right). All the items listed below are blue and white.